In today's post i am again sharing experience of three more devotees. Sai Sister Deepika Ji from USA says: Sai Baba helped us in a way that even I and my husband couldn't believe that miracle happened in my life. My husband is good devotee of Baba. Because of him, I got inspired and I started praying and believing in Baba. I used to attend Baba Aarti on every Thursday. After my marriage, I came here USA. We live in a place there we do not have Saibaba Temple. So we were not happy that we were unable to attend Baba Aarti. We decided to give Aarti at our home on every Thursday. Then we started giving Aarti at my home. On October 6th, I started reading "Sai Satcharitra" for the 2nd time. I have completed it on October 13th and on that day we did “ABISHEKAM” with PANCHAMRYTHAM. After puja at 9 PM, we went to one of my friend's place, which is just opposite of my house. At 10 PM, we returned back to my home. When we were just getting on to the stairs, we noticed that fire alarm was ringing. We got shocked. We just opened my door, and there was nothing to see because of smoke. The fire had started few minutes back. We just called 911 and by the time the Police came, my husband made the fire to control with his legs with the help of his friend. All was over. Every time when we give Aarti, my husband used to keep his office laptop in front of God. On that day, we forgot to take that out. We don’t know the reason why that happened on that day. I mean because of deepam (lamp) or laptop that fire came. Finally because of Baba, nothing got fired except laptop, carpet and one door. Finally fire fighters enquired about what we did on that day and left. For next one week, we stayed in my friends place. There the actual thing began to start. Every one used to say that we didn't have renters insurance we would have to pay minimum of $20-$30k to repaint and repair the house. We lost all of my belief in God. We were helpless. With all that tensions, finally on October 31st, we got news that we do not need to pay even a penny also. "SRI SACHIDANANDA SADGURU SAI NATH MAHARAJ KI JAI"
And my husband's laptop was 80% burnt. His manager asked him to return the burnt one and take the new one. He was able to take out all of his data from that one. See what a miracles. We don’t know why that was happened, but God made miracle by protecting everything. Om Sai Ram. Sairam, please bless my family to experience all miracles of You as always. 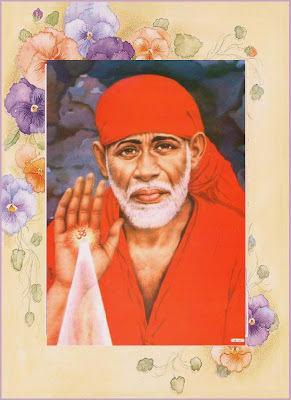 All Sai Devotees, believe in Saibaba and save your life. Anonymous Devotee from India says: Dear Hetal Ji, thanks for your work. You are blessed person selected by Shri Sai to carry on this work, and as well, blessed ones are drawn towards this site to read and post their experiences. Hetal Ji, thanks for posting my first experience. This is the second one. Please keep me anonymous. Thanks. I was working in a place near a holy hill, where I was given accommodation. One morning, I woke up, opened door and as usual facing hill I prayed and I came 2 or 3 steps back. Then suddenly, I observed a small snake inside my door. I was scared a lot. Suddenly I remembered the name SHESHA SAI. I prayed to our Saibaba and said, “Baba I take it as You have come to give me Your Darshan in form of Shesha (Snake). Please see that I am not scared”. Anyway snakes are bit common in this campus so security people will be called for help and they would catch-hold and leave it in a far off place without harming. So I called them. They took 5 to 10 minutes around to come. Meanwhile I was praying Sai, and thanking Him for giving His Darshan, and observed that my scariness had disappeared almost. The snake was moving so slowly that I was surprised and then guessed our Guru Sai doesn't want to scare me. Then I prayed, “Hey Baba, when those people come, please don’t rush, to avoid them harming You. So find Yourself a safe way and move out by Yourself”. Suddenly the snake moved towards a hole that was connected to drain water out. Then again I said Baba, let them see a part of You so that they should not think that I am fooling them. As the security people were coming, it moved so fast my God I was taken back its speed. By the time they entered inside my room, only tail part was visible now for few moments, which soon after I showed them, and then it went out. Then later, I learnt that it was poisonous snake. All I know is that, it was Baba in form of snake. I suppose it was near to door where I stood praying to Goddess for few moments. It didn't harm me there. From the moment, I saw, it was moving very very slowly (to not scare me) till security came. After which it moved at a scaring speed out with its tail part out to let them see its presence exactly as I prayed Baba. Shesha Sai did same thing that I prayed him. Please be with us and guide us as always GURDEVA. Sai Sister Aruna Ji from India says: Dear Hetal Ji. Below is my experience which happened just two days back. Though it is a very short experience, I request you to publish this one as I have promised Baba to share this experience with Sai devotees on this blog. Hetal Ji, please don't share my e-mail id here. On 10th march, I had to do some important bank work. So I went to the branch near my house. I was really surprised to see the long queue as it was Saturday and they work only half day. The work was so important that I was really tensed as in what to do. Immediately I moved out and approached to the other bank, which is 10 km away from my house. All the way, I was worried whether I will be able to complete the work or not. As that work was pending from many days and I won't be able to do during the weekdays due to my tight schedule in the office. When I reached the other bank luckily there were not many people in the queue. To inquire, I stopped at one of the counter. The gentlemen there replied that I am at the right place. I was behind just two people waiting anxiously for my turn and praying at the same time. It was taking really long time for the process. Maybe due to some server problem, he was not able to complete the transaction. Usually it takes less than a minute for the same. I was so restless, than the person in the counter said let me try with yours. The people, who were waiting in the queue, started moving away. I was only praying to Baba. In the first two attempts, it could not complete the transaction. The last time he re-started the system and was trying really hard from his end to complete the transaction. Again the third time he tried. I was busy praying Baba – Please, Baba, complete this process today itself, give me one more experience to share with Your devotees. Please, Baba, please help me again this time. The transaction was completed. It was a great miracle. Sai Baba instantly answered my prayer. I am sharing this before it is too late with all my Sai devotees in this blog. Love to read all the experiences. Babaji love u. Jai Sai Ram. baba forgive me for all the sins i have committed knowingly or unknowingly. im still a child. take me in your refuge. love you baba. om sai ram...thanx for sharing all of ur experince of life by baba and m waiting when i will share my experince here.baba says not a leaf can moove without baba's grace,so im waiting for his grace to post here. Now im at my husbnad place.tomorrow is savitri vrat....there is no changes in my husband.we sleep in same room but no relation has yet started tht baba also know evrything...m just prying baba to give me back my huband a normal husband with whome i can talk freely,i can go out,i can share all my things which a noraml husband wife does after marraige and that husband wife closness is missing from the day 1 of my wedding. OM SAI SRI SAI JAI JAI SAI OM SAI SRI SAI JAI JAI SAI OM SAI SRI SAI JAI JAI SAI!!! Sai Baba, please forgive all my sins and show me the right path. sai baba aap ko mera pranaam.baba help me and please always keep me and my children safe. one thing i have experience is this man so called saint is showering his so called blessing in only female than male..... i found people over here are over expressive .... if u trust him truly... ur will be screwed for surethat is wat i experience..... too much for this man so called saint. Hey sai ram. Baba i am waiting for your reply from last 9months plz show me your blessings i cant take all this bad situations plz baba bless me as soon as possible. Jai sairam. Who is this anon devotee? Please dont say such things about Baba. It sems u r disillusioned about him. One day that will go away and u will realise on your own what u r doing now.I couldnt believe what I was reading and had to read it few times to understand that u r talking of our Baba in this fashion. If u read about his life , there was no male female devotee thing--- he was and is much above all such petty things. Do not sully his name by saying and hurting all other devotees. pls come over the male n female thing,thats not good for you my friend..
@ angry devotee, I feel sad to read your comments, I guess you are in a lot of trouble at the moment. Please don't expect miracles because you have turned to God. Introspect yourself. What has your life been like? Its Human nature to turn to god only when we are troubled. What Sai wants is to love and devotion to him all the time. Is your love for your parents seasonal ? No , So why should it be like that for Sai. Just because you are not getting any postive signs for your problems does not mean Sai is to blame. Remove all the negativity from your outlook and let Sai's love fill your heart and soul. Turn your life over to him and You will find peace even during troubled times. I am going through very troubled times. I can talk about it to no one but only Sai and each day he shows me that he is with me. Whatever I am destined to suffer I will, but I know Sai will see me through this. Even now it is he who has made me write this to you. I pray to our beloved Sai to show you the way and help you find peace. Very nice experiences! Deepika Ji, it is a wonderful miracle that Baba preserved all the data on your husband's computer, told you to come back at the correct time (before too much damage was done) and also you didn't have to pay anything for the damage. Sometimes Baba shows us his love through miracles like this one. Aruna Ji, Baba must have showed you his love through this miracle at the bank; just thinking or saying Baba's name is powerful enough to change our negative circumstances. Devotee from India, you are very lucky Baba came to you in this form and even when you asked him to leave before the security guards came, he quickly left. It reminds me of the story of the scorpion that came to listen to Baba's teachings in Sai Satcharitra. Om Sai Ram! Hetal Ji , please delete those 2 bad comments , they are not even comments it looks they just want to write something....if you coould then please remove them.